While playing Risk with random initial positions, sometimes you may find yourself all over the place owning a country in just about every continent! You blame your luck and wonder how other players managed to get half of some continents already and seem to be way ahead of you. Consider the following configuration. You are playing as Red and you are indeed scattered everywhere. Is there anything you can do to get out of this dilemma? How can you turn your weakness into strength? Suppose you are playing online Risk and a player starts to behave rudely in the game. For example, in the chatbox he states that: “You moron, why the hell did you do that?”, or, “%^$ newbies! They haven't got a clue how to play. %%%^&^ get rid of them!” and similar aggressive remarks. If you say “I don't like the way you chat”, or “I am not happy with your tone” or similar statements, it is likely that you start a long argument that will only make you more upset and the game less enjoyable. It turns out that there is a simple technique you can use to completely turn the table around and put the ball in your opponent's court. An angry player is likely to make mistakes and you should avoid to become angry yourself. The solution is as follows. Have you ever wondered how can you protect yourself against a new player who may choose to break a deal with you in the current game? If you have never played with this player before, how can you discover what type of a player he is? What if you agree over something with him, and he comes back denying it later on? You could end up in trouble. Is there a technique that you can use to know if he has a tendency to stab you in the back? It turns out that there is indeed an effective method. Are You an Opportunist or a Moderate? Opportunist. They approach every task with multiple potential solutions. Moderate. They see the world in steps. They make one move at a time. They are to the point. Using Risk as the pretext of examples, the following, which is loosely based on Iceberg Slim, makes this more clear. Sometimes it can be incredibly difficult to say ‘no’. It is a simple word, but it just feels wrong to say ‘no’ when someone asks for a favour. Of course saying ‘no’ is easy if you don’t care about the person. What if you did care about the person, but you still wanted to say ‘no’ without hurting his feelings. An example of a Risk game may clarify this. 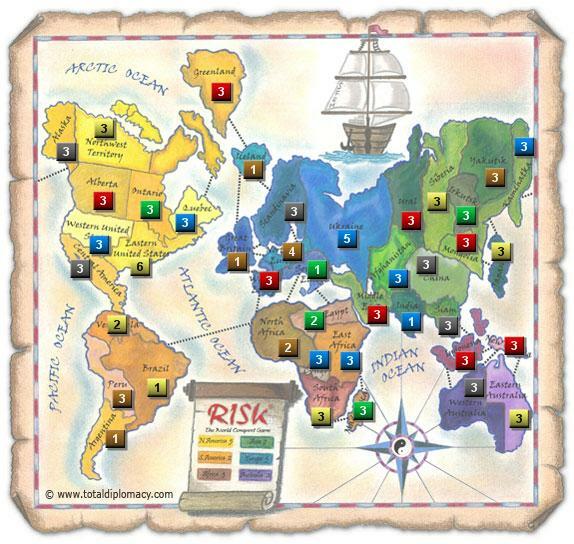 Suppose you are playing Risk online and your strategy is to conquer a continent such as South America. You also have some armies in Europe. A player approaches you and asks you to move your armies out of Europe. You want to say ‘no’. However, you want to say it in such a way that your opponent doesn't become hostile to you. There is no point in making enemies in the process. How do you do this? This article is part of a series of articles that show you how to win in any competition, including Risk. In the previous article you were shown how to be in command of your own mind. Control the mind and you can control everything. Here, the focus is on your opponent's mind. You will learn how to control it or even break it. When it comes to competitions, everyone wants to win. The problem is that there can be only one winner. If you want to win, you have to stand out from the competition. Is there a secret behind this? It turns out that there is. After all, not everyone can win. This series of articles provide a number of techniques that enable you to compete effectively in any competitive environment. Winning in Risk is no exception and examples are provided to demonstrate the key concepts. After a lot of diplomacy and propaganda, you manage to get your opponent to the negotiation table. You make fantastic moves in the negotiation and manage to convince him to make a deal with you. So far you are very happy with the results. However, there is one issue left. How do you make sure that your Risk opponent will commit to what he just promised? Surely, after all the hard work, you don't want to see all your efforts going to waste. What should you say or do to put him under pressure, so that even the thought of quitting on you does not occur to him? There always comes a time when you want to influence others. You may need to use a variety of psychological tactics depending on the situation and the person you are dealing with. In this article, a number of scenarios are presented and for each a course of action is suggested. Remember, what matters is always the end game. If you want someone to do something for you, you need to keep focusing on the outcome. You need to make it easier for the other person to make the right choice, the choice that you desire. Here are a number of scenarios and solutions to help you get what you want.